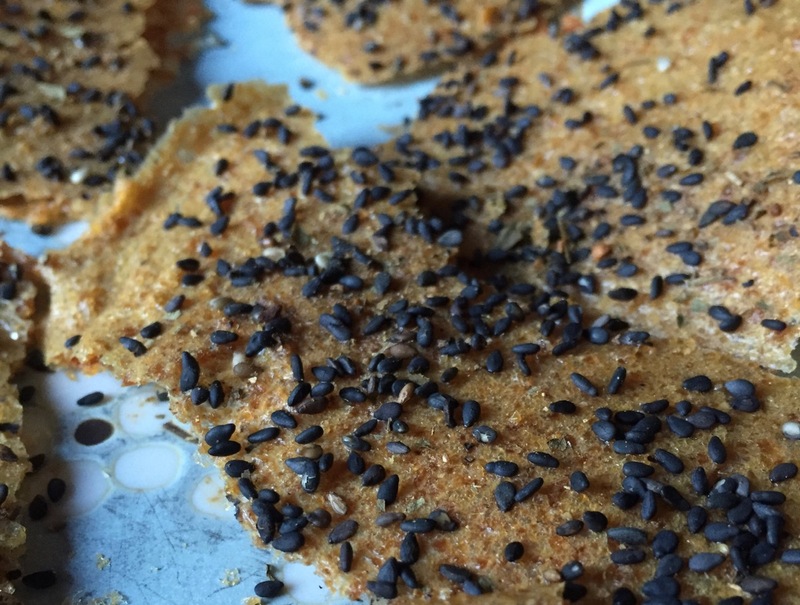 I had to find out if this super-simple method for making rice crackers works. It sounds so ridiculously easy! It couldn’t possibly work, right? But it does! All you need is some leftover rice, a food processor, a baking sheet with a silpat, and about 2 hours, and you can have your very own homemade rice (or any grain) crackers. And they’re fun, crunchy, and delicious! And as a bonus, you know exactly what’s in them – no preservatives, no cross-contamination from nuts or other grains if you’re worried about that for yourself or your kids, or other unwanted ingredients. Of course, the fact that there are no preservatives means you’ve got to eat them pretty much right away, but I don’t think you’ll find that very difficult. It may not be completely obvious what these are. Because this is some next level carrot action! Have you heard of pigs in a blanket? Little smoky sausages in a crispy crust? Well, these are little smoky carrots in a crispy crust! Baked, not fried, and containing hardly any fat. How on earth did I come up with this? It falls into the category of having to find out if it could possibly work. I read the basic recipe in The Best Casserole Cookbook Ever, and having also been on a Sheet Pan Suppers bender, I decided to make them on a baking sheet instead of in a casserole dish, thinking the shallow sides would allow more air circulation to add crispiness. 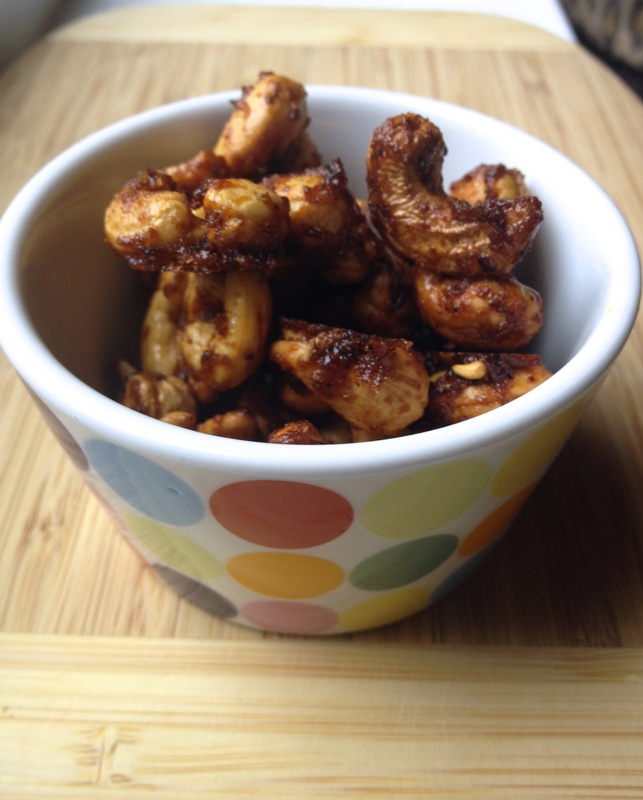 I also added a hit of smoked paprika, which made a huge difference in turning them into a super-savory snack. They’d be really good with some sort of dip, but we didn’t wait for that – we ate them right off the pan, standing up in the kitchen! 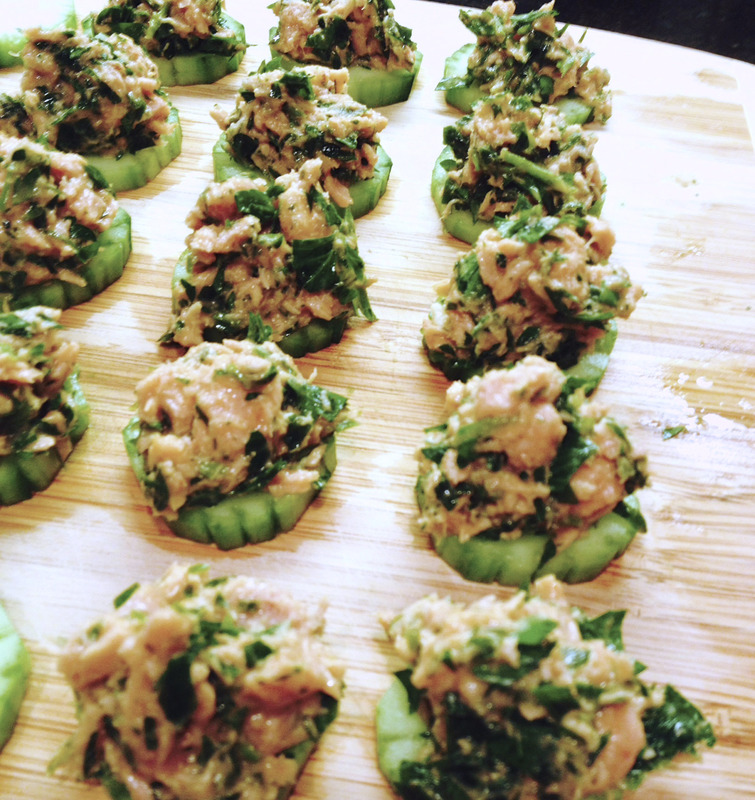 Don’t judge us until you’ve tried this fun little appetizer for yourself! 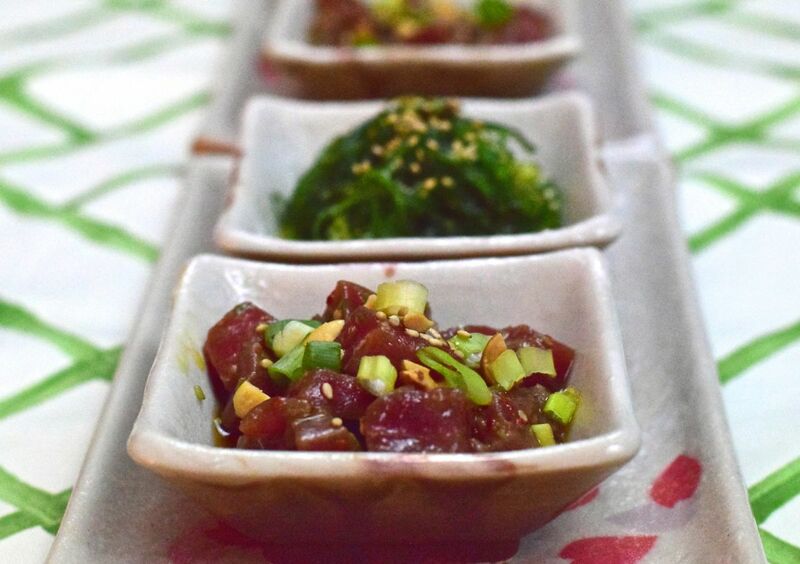 Poke (pronounced POH-kay) tuna is tuna sashimi marinated in a flavorful blend of sesame oil, ginger, garlic, lime, and soy sauce, topped with scallions, sesame seeds and nuts. I believe kukui nuts or macadamia nuts are the classic nuts to use, but you can substitute peanuts if you haven’t got any of those lying around. 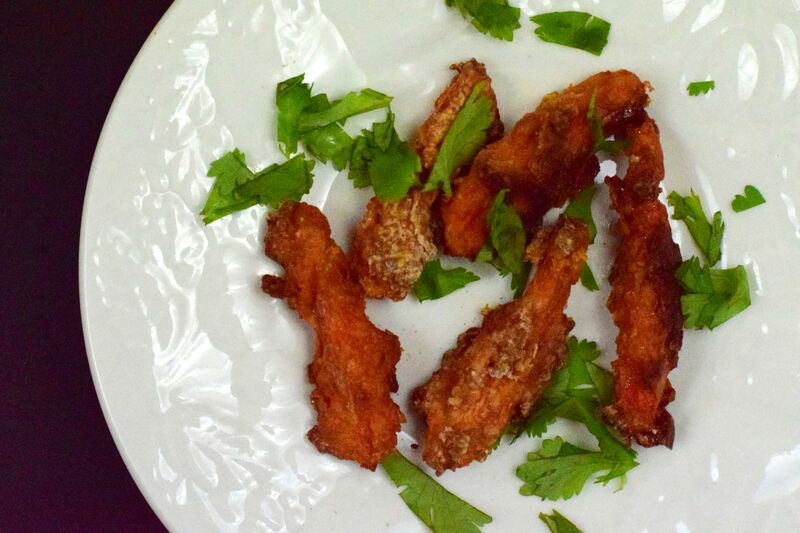 Although it seems exotic, this dish is actually very easy. Perhaps this is obvious, but there is no heat involved, so it’s fabulous for summer. It is usually accompanied by seaweed salad, either mixed in with the tuna or on the side. Those little orange bubbles are salmon roe caviar, which you may have had before on top of sushi rolls. Each bubble is a burst of salty, fishy goodness! A small container is not very expensive at the Japanese or Asian market (I paid $4.50 for enough to make 20 crackers). The trick is to rush it home, well-chilled if possible (my shop provides free ice, but you could also bring your own cooler, or buy some frozen items and make sure they’re in the same bag). When you get home, put it directly in the fridge, then eat it the same day. 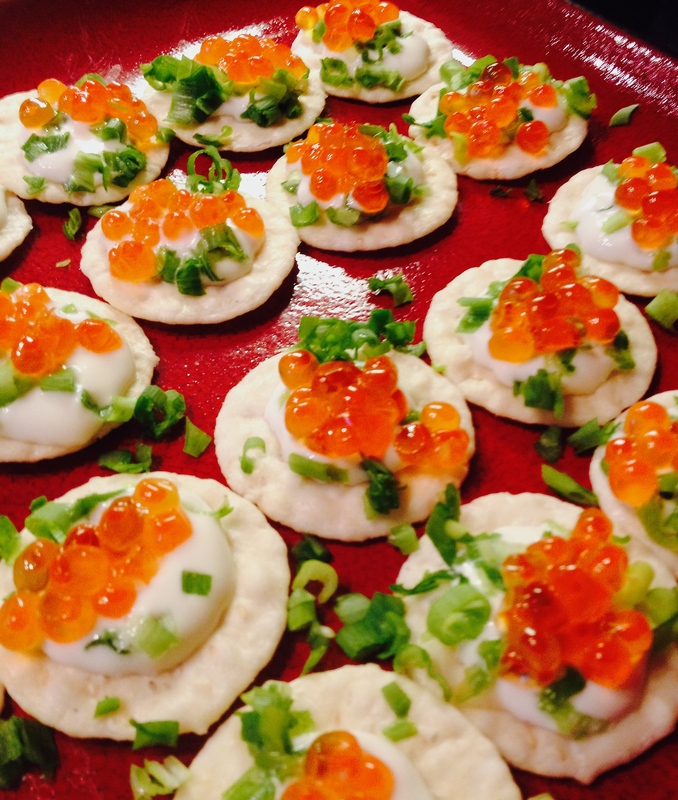 I’ve borrowed from the Russians to create this fun East-West fusion appetizer. And IT’S SO EASY. Impress your guests, or just yourself!